A taxi driver from Bognor has been banned from driving for 20 months for drink-driving. Claire Francis, 43, of Collyer Avenue was arrested in Hay Road, Chichester, on December 3 and charged with driving with 82mcg of alcohol per 100ml of breath in her system. police said. She was also ordered to pay a £180 fine, £400 costs and a £30 victim surcharge. Kevin Wright, 47, a mechanic, of Halley View, Selsey, was arrested in Chichester Road, North Bersted, on December 12, and charged with driving with 93mcg of alcohol per 100ml of breath in his system and failing to stop after a road traffic collision. At Crawley Magistrates’ Court on March 26, he was disqualified from driving for 24 months and sentenced to a 12-month community order, requiring him to carry out 125 hours of unpaid work. He was also ordered to pay a £120 fine, £85 costs and a £30 victim surcharge. Peter Newman, 20, unemployed, of North Road, Waterlooville, Hampshire, was arrested in Dukes Road, Arundel, on December 14 and charged with driving with 5.6mcg of cannabis per litre of blood in his system. At Worthing Magistrates’ Court on March 6, he was disqualified from driving for 12 months. He was also ordered to pay a £384 fine, £85 costs and a £38 victim surcharge. Jordan Ireland, 19, unemployed, of Ash Grove, Bognor, was arrested in Yapton Road, Middleton, on December 14 and charged with driving with 124mcg of benzoylecgonine per litre of blood in his system. At Worthing Magistrates’ Court on March 13, he was disqualified from driving for 12 months. He was also ordered to pay a £120 fine. 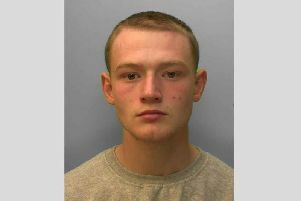 Matthew Goddard, 26, a mechanic, of Spiro Close, Pulborough, was arrested in Whitehawk Way, Brighton, on December 16, and charged with driving with 199mcg of benzoylecgonine and 45mcg or cocaine per litre of blood in his system. At Brighton Magistrates’ Court on March 1, he was disqualified from driving for 12 months. He was also ordered to pay a £40 fine, £50 costs and a £30 victim surcharge.